If you use Fake Books, particularly the larger ones, you may have noticed the plastic Music Rack on the PSR-2x00 seems a bit inadequate. 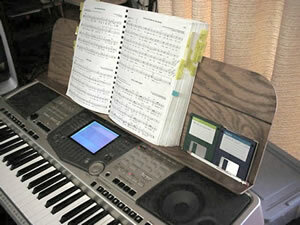 Phil Hall came up with an innovative solution to enhancing that Music Rack. Phil's solution is presesented below. 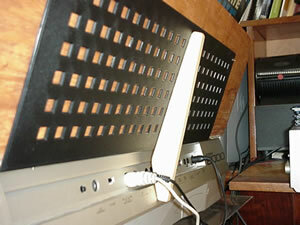 - Joe W.
Here is a front and back view of my music stand. The front shows that I made it wider to hold disks and other odds and ends. But it also has a deeper ledge so that it will hold those 1,000-page fake books without the pages hanging down and hiding the screen. The shelf does kind of hide the top row of buttons a little, but not bad. The back and bottom of the "width expander" are just some left over pieces of wall panelling, and are held in place with a few small nuts and bolts through holes drilled in the original music rack. The added paneling on the front is 35" wide, 9" high and the shelf is 2" deep. That just happened to be the size of the material that I had available, but it works quite well. The back shows the support for these heavy books. I just took a piece of cardboard and cut it with a pair of scissors until I had a good fit, and then used that for a pattern. The brace was cut out of a piece of scrap pine about a half inch thick. It is held to the factory music rack with just a couple of wood screws through the new "width expander." It does not attach to the main part of the keyboard in any way. It just rests against it and the music rack can still be just pulled out of the slot, as before, for transporting. Choose the left and right location so that it does not block access to any of the receptacles on the back panel. The music rack will slide sideways a little bit to allow access, but not much. I have included a tracing of the bracket and included the dimensions. I made the original just by taking a piece of cardboard and pair of scissors and trimming to fit with the music rack in place. I would recommend that anyone making one should make a pattern first and check it for fit before cutting the wood.